Raloy RD119 rack console with a VGA KVM features a 19" TFT LCD and an integrated (DB-15 connection) single or multi user KVM switch. The RD119 is the ultimate rackmount keyboard/monitor solution, providing a keyboard and mouse console, an independently accessible LCD panel and optional KVM into a single unit taking up only 1U (1.73 in.) of server rack space. 8, 16 & 32 Port Over IP KVMs (DB15 or CATx). 1-4 User, 1-3 Extended & 1-2 IP Consoles. Rackmount console + integrated DB-15 KVM in only 1 rackmount unit. Dual Slide: retractable keyboard & independent LCD display. 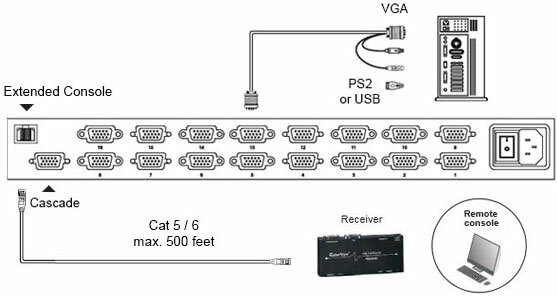 DB-15 VGA 4-in-1 cables included, with connections for PS2 and USB servers (p/n RCE-6). Cascade switches up to 8 levels, 128 servers. RD119-KVM Back & Extended Application. 4-in-1 Cables: DB-15 to VGA, USB & PS2. Multi-platform: Mix various PC, SUN, MAC G3/G4/iMac, IBM, HP & DELL servers.